The weather was fantastic on Tuesday so I thought I'd go for the first ride of 2012. I had loaded up the gopro and my camera, now just to select a route. I had wanted to do the road from Oberon down through Taralga to Goulburn for a while now. It is fully sealed now however there are some good and bad sections along here. I initially headed out over Bells Line to Lithgow, then down to Oberon. It was a nice cool start to the day but was starting to warm up by the time I got to Oberon. 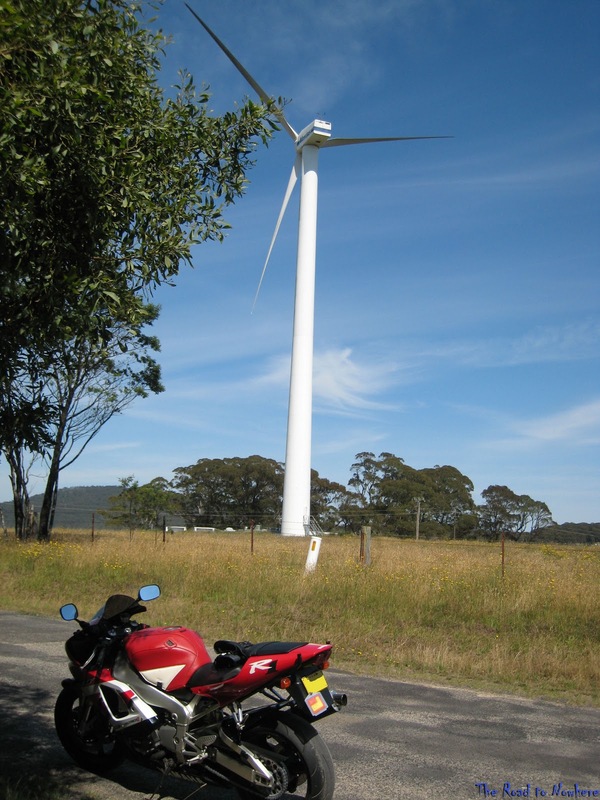 These 2 wind farms are located at Hampton on the Jenolan Caves road. 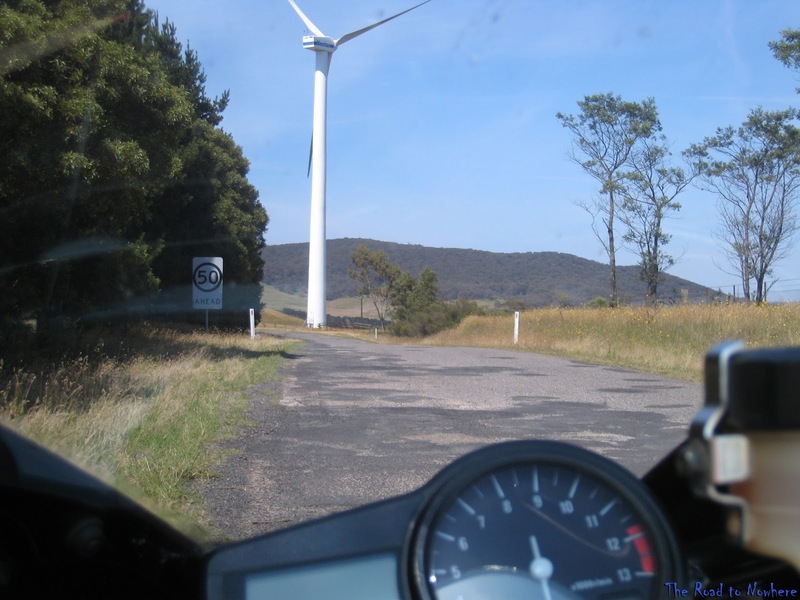 Heading south out of Oberon along the Goulburn - Black Springs road towards Taralga the road skirts around Lake Oberon then on into Black Spring which has a sharp left turn towards Taralga. After this the road flows across the tops of the hills with pine forests on both sides of the road. Be careful around here of timber trucks during week days. There are many un-sign posted corners that are on blind crests of hills here which you will need to take care on, as some of these can be quite challenging. An echidna had decided to play chicken and run across the road in front of me about 10km south of Black Springs. The road has quite a few straight sections as well but then will suddenly change back to sweepers up and down hill. I would think that around dawn and dusk there would be a great deal of kangaroos, wallaby's and wombat's around out here, so don't get caught out after dark on 2 wheels. There is one section of road coming down hill where the road is quite wide as in the pics shown here. 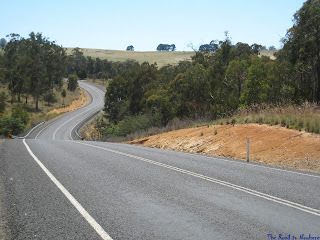 When you come over the blind crest of the hill on a down hill right hander the road suddenly goes from a 2 lane wide painted road to a narrow rough unpainted section not much wider than one lane. Hitting this at speed was quite a surprise.....think sphincter puckering. The road descends down a steep hill winding its way to the bottom where it meets the Abercrombie river then winds its way back up again. This section is very rough and steep and not very well surveyed, they need to spend a bit more to upgrade this section. 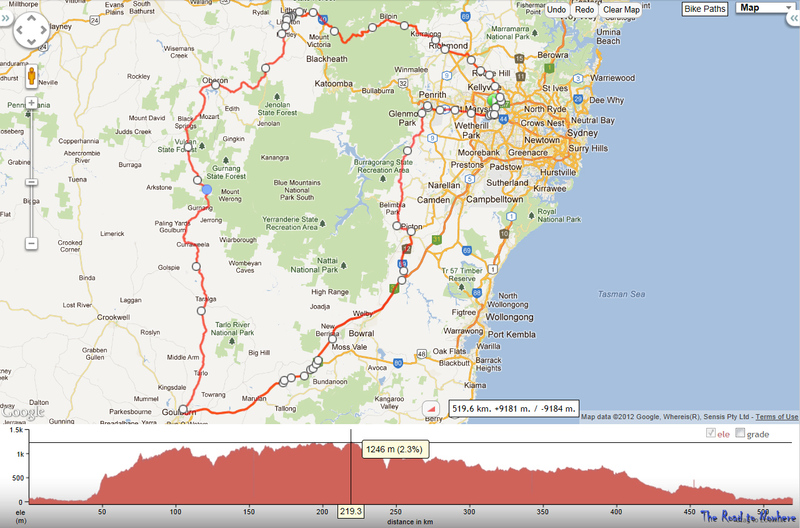 Much like the 15kmh bends on either Macquarie Pass or Kangaroo valley but a lot rougher. The road then opens back up into some long straights and sweeping bends up hill and down dale until you come out at Tarlaga. After Taralga the road surface becomes a lot smoother but is also much straighter but still has some nice sweepers on it and one short twisting section. I saw about 15 other bikes on this road being a Tuesday and all, it seems quite a popular road, and I would also think police presence would be also be low. I got into Goulburn about 12:15pm and it was getting pretty hot, it topped out at 35°C so I hit the Hiberian Hotel up for lunch and a cold beer. After lunch it was back to Sydney, with about 90km of boring free way till I could turn off the freeway at Bargo and head up through Picton and onto Warragamba then home. The camelback was a life saver again today. I don't know how I got on without it before when the temp goes into the mid thirties. This road would be a great alternate for riders going down to the GP from Brisbane if they are looking to bypass the urban sprawl of Sydney. A couple of good choices for avoiding Sydney and still riding some good bike roads. Putty Rd, Bells Line to Lithgow, Lithgow to Oberon, then Oberon to Goulburn and continue down to Clyde Mountain and further south. 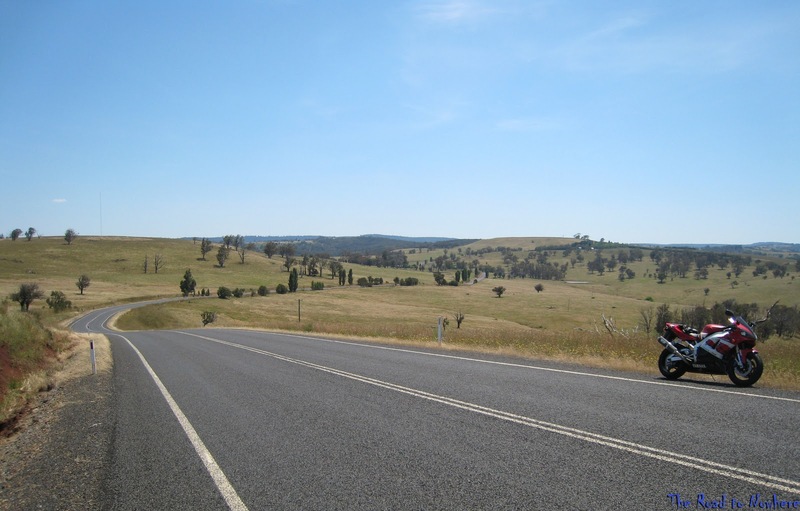 Bylong Valley Way from Denman - Rylestone, then to sofala and on to Bathurst, Bathurst to Oberon and down to Goulburn. Sounds like a great day of riding - well all except the pucker moment. I wonder why that road narrowed at that particular spot. The pictures of the sweepers up and down hill look like a lot of fun. Trobairitz - Not sure why the road was so dangerous like that, Maybe they ran out of money whilst building the road at that particular(Nasty) point. Andrew - they can be pretty fast as I was cruising in license loss territory.